You suddenly realize that you need an Osterville roof cleaning professional to work with and have no idea who to call on. This may not be as common a service need as an emergency plumber or AC repair person. However, if you intend to be a long term homeowner, this is also something that you need to locate a professional roof cleaner for. 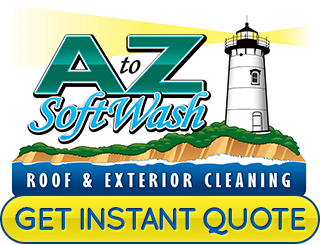 When quality matters, as it always should for your home or business, the name you can count on is A to Z Softwash. We take great pride in the work that we do and it shows in the results that we are able to get for our clients. Don't keep putting off getting your rooftop professionally cleaned just because you don't know who to call on because now that problem is solved. People know about roof repair and even roof replacement, but few realize they are also going to need a roof cleaning expert in the Osterville area. Here is the thing you have to realize, those black streaks you see on your roof – those are red flags! It is a type of algae that leaves streaks when rain washes them down the roof and it eats your shingles. Not dealing with the moss, algae and other contaminants living on your roof means that your home will not be as energy efficient. These substances cause your roof to be unable to reflect sunlight which then makes your home hotter. Your energy bill goes up and it means that your home is not Eco-friendly. A dirty roof doesn't just impact the curb appeal, it diminishes the overall value of your home. Until you get your roof professionally cleaned, your property value will stay low. Plus, you are increasing your risk of needing to replace your roof before it should be time. You may or may not have heard of softwashing before but you probably are not yet aware of just how effectively it cleans. 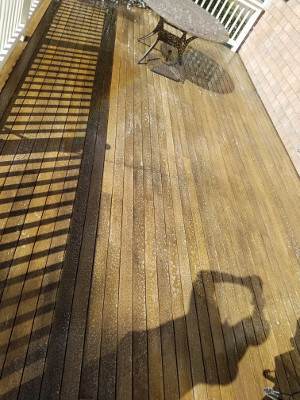 This process is a gentler alternative to pressure washing in Osterville and utilizes cleaning agents to help make the process more effectual. The truth of the matter is that you are actually putting your home at risk of major damage by relying on just power washing to get the job done. Having cedar fencing or a deck or porch is a huge asset to your home, however only if you take good care of it. We want to be a part of helping you maintain the condition and value of your wood surfaces with cedar restoration. 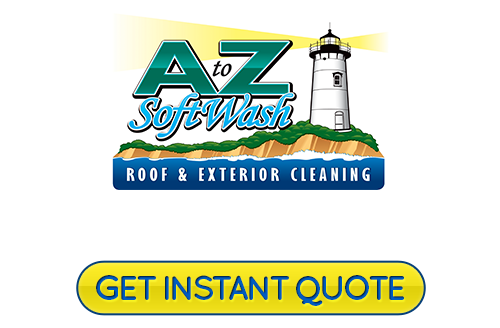 For all your exterior cleaning service needs, you can rely on A to Z Softwash to get the job done. If you are looking for a reliable Osterville roof cleaning or pressure washing professional then please call 508-209-7795 or complete our online request form.